Burke Mountain Homes® believes strongly in the value of community. We are dedicated to the growth of this diverse and multicultural neighbourhood. We believe a connected community is stronger, safer, more tolerant and a wonderful environment to raise a family. We want to reward and encourage the next generation of leaders to continue down the path of community-minded action. This award is intended to help foster this commitment and to help build relationships and ‘social connectedness’ with peers, adults, and activists sharing a cause. We want to help our young leaders develop an increased sense of social responsibility, a global view of society and a heart for ‘giving back’ and helping others. $1,000.00 open to Grade 11 & 12 students who reside in the Burke Mountain area. This award recognises well-rounded high school students who have demonstrated strong community service and leadership, scholastic strength and an entrepreneurial spirit. 1. Community engagement is a criterion that supports our belief that leadership is ‘more than just good grades’. In this section, you may showcase your contribution to the community. Provide information regarding the specific role you played in a service organization or community-service initiative. • Did you have a leadership role or other pivotal role within a school or community organization or group? • Have you given your knowledge, skills and talents to any community endeavour that is given to improving the lives of others or benefiting the community? • Have you had a significant volunteer or paid experience with a school or community organization? Tell us about it by listing the organization(s), and by describing the role/activity you undertook. 2. Write an essay of no more than 800 words outlining how the young leaders of tomorrow can contribute to the growth of an emerging community, like Burke Mountain, today. 3. Provide a minimum of two letters of recommendation; including one from a teacher and one from a community supporter. 4. Provide any other supporting materials/information that you feel demonstrates how you are the most deserving candidate for this award. 1. The final decision regarding the winner will be made by Burke Mountain Homes®. That decision will be final and will not be open to appeal. Only the winner will be contacted. 2. The information submitted by all applicants will be thoroughly checked and verified before any payments are processed. Should there be any false information submitted, the entire application will be disqualified. 3. Each student may only apply once per school year. 4. 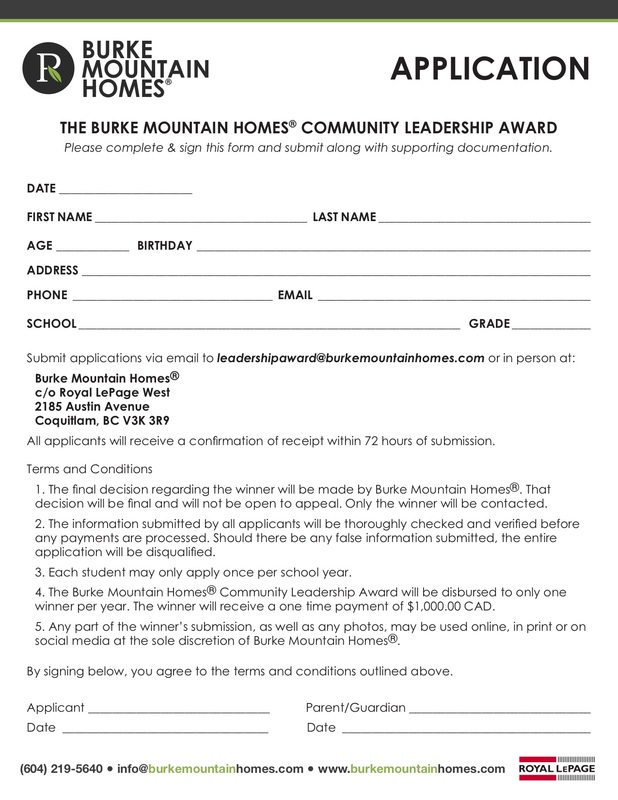 The Burke Mountain Homes® Community Leadership Award will be disbursed to only one winner per year. The winner will receive a one time payment of $1,000.00 CAD. 5. Any part of the winner’s submission, as well as any photos, may be used online, in print or on social media at the sole discretion of Burke Mountain Homes®. All applicants will receive a confirmation of receipt within 72 hours of submission.